Soane office, London: Palace of Westminster: design for one of the principal entrances ito the new House of Lords, 1794: perspective. 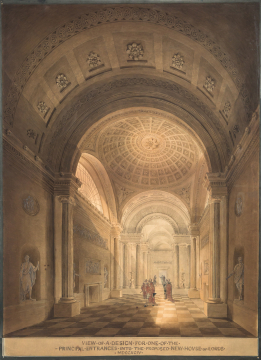 You are here: CollectionsOnline / Soane office, London: Palace of Westminster: design for one of the principal entrances ito the new House of Lords, 1794: perspective. The frame of this work is canted so that it can be viewed well in its position fairly high up on the south wall of the Breakfast Room.